New Release: Grace’s Ground War! The exciting Virtues and Valor serialized story continues with book 5! 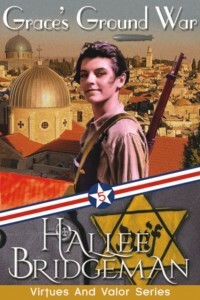 RUTH AUBERTIN’s father, a highly decorated veteran of the Great War, moves his family from British Palestine to the wild of Great Britain after the Hebron masacre in 1929. He has always known the Germans would return to France, and trained his children from the time they could walk, turning them into finely tuned weapons with multiple skills ranging in weapons training to hand-to-hand combat. When the Germans roll into France, Ruth and her brothers volunteer with the British Special Services and Ruth joins the Virtues team under the code name of GRACE. Never knowing the bond of sisterhood before, Ruth grows close to the six other women on the team and learns to rely on them and their varied skills as she goes undercover in Occupied France. Working directly for the notorious Praetorian, she and her team plan the largest prisoner escape in the war to date. The arrest of TEMPERANCE raises the stakes. Now they have to move their time table up, increasing the overall risk of the mission. Can Ruth and her team pull off the mission, or will too many variables crash together at the wrong time? GRACE’S GROUND WAR is part five of seven serialized novellas entitled the Virtues and Valor series.